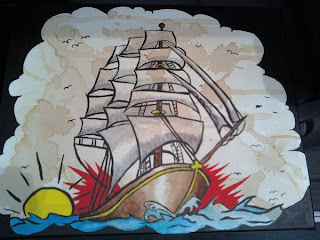 Tom Martinez Jr.: Sailor Jerry style for my friend's new apt. Sailor Jerry style for my friend's new apt. I am working on a whole series of artwork for my friend Alana. She just got a new apartment and she asked me to make it a home. She is a huge tattoo and punk rock fan, so the theme of all the rooms will be Sailor Jerry style tattoo flash. It is fun and a nice exercise to mimic a style but add my own flavor to it. I will be posting up some pictures as I work on it soon. This is a canvas painting of SJ's sailboat. I tea stained the canvas before I started painting on it to give it an old map look.